When curled up with a good book, do you remember being transported to the moors of northern England, to the red roads of Georgia, or to dear little Prince Edward Island? The importance of place in a novel, or story, can sometimes be tantamount to the telling of the tale. Take Scarlet out of the old south and what do you have? Take Heathcliff out of the moors and who is he? A sense of place puts the reader in the story, puts the character up against something- whether it is a harsh environment they are grappling with, or a cultural imperative which leaves them feeling as though the deck is stacked against them. What are the underlying layers of the place your character’s inhabit? What are the threats? Did the place start as a swamp, or a thriving port? Did they have to beat back the forest, or are the bushes full of snakes? Who came there first? Was it miners, or homesteaders? Who was indigenous? What was the climate? Do you remember those green felt boards kindergarten teachers used to use as props? Remember how they would stick felt things on to the green board to teach us how to count ducks, or whatever. The setting of a novel is kind of like the green felt and the characters are then the ducks. These are details that can make or break a story. By taking a look at the great ones, we can gain many tips, as we set out to describe the places where our characters live and the role that place plays in the story. It occurred to me that I actually love place driven stories. While a place can never be the whole story, it can be a huge part of shaping the action of a story. There is nothing that defines a writer more completely than the concept of really honing in on the character of his home town, or region, and then becoming synonymous with that place. Consider Margret Mitchell with Atlanta, James Joyce with Dublin, the Brontes with the moors and Pat Conroy with South Carolina and then my perennial and personal favorite and the best selling book of all time, L.M. Montgomery’s Anne of Green Gables and Prince Edward Island. Other writers may not be from a region, but can go there and define it nevertheless. Take James Mitchner with Hawaii and the middle east, Leon Uris with Londonderry in Northern Ireland, Passage to India’s, E. M Forester and then of course, Shakespeare himself. The place will shape the lives of the characters as they adapt to changes through time. “They had driven over the crest of a hill. Below them was a pond, looking almost like a river so long and winding was it. A bridge spanned it midway and from there to its lower end, were an amber hued belt of sand-hills shut it in from the dark blue gulf beyond, the water was a glory of many shifting hues- the most spiritual shadings of of crocus and rose and ethereal green, with other elusive tintings for which no name has ever been found. Above the bridge the pond ran up into fringing groves of fir and maple and lay all darkly translucent in their wavering shadows. Here and there a wild plum leaned out from the bank like a white-clad girl tip-toeing to her own reflection. From the marsh at the head of the pond came the clear, mournfully- sweet chorus of frogs. There was a little gray house peering around a white apple orchard on a slope beyond and, although it was not yet quite dark, a light was shining from one of its windows. “That’s Barry’s pond, “ said Mathew. She opened her eyes and looked about her. They were on the crest of a hill. The sun has set some time since, the the landscape was still clear in the mellow after-light. To the west a dark church spire rose up against a marigold sky. Below was a little valley and beyond a long, gently-rising slope with snug farmsteads scattered along it. From one to another the child’s eyes darted, eager and wistful. At last they lingered on one away to the left, far back from the road, dimly white with blossoming trees in the twilight of the surrounding woods. Over it the stainless southwest sky, a great crystal white star was shining like a lamp of guidance and promise. “That’s it, isn’t it?” she said pointing. It was broad daylight when Anne awoke and sat up in bed, staring confusedly at the window through which a flood of cheery sunshine was pouring and outside of which something white and feather waved across the glimpses of blue sky. For a moment she could not remember where she was. First came a delightful thrill, as if something very pleasant: then a horrible remembrance. This was Green Gables and they didn’t want her because she wasn’t a boy! But it was morning and, yest it was a cherry tree in full bloom outside of her window With a bound she was out of bed and across the floor. She pushed up the sash- it went up stiffly and creakily, as if it hadn’t been opened for a long time, which was the case; and it stuck so tight that nothing was needed to hold it up. Anne dropped on her knees and gazed out into the June morning her eyes glistening with delight. Oh, wasn’t it beautiful? Wasn’t it a lovely place? Suppose she wasn’t really going to stay here! She would imagine she was. There was scope for the imagination here. A huge cherry-tree grew outside, so close that its boughs tapped against the house, and it was so thick- set with blossoms that hardly a leaf was to be seen. On both sides of the house was a big orchard, one of apple-trees and one of cherry-trees, also showered with blossoms; and their grass was all sprinkled over with dandelions. In the garden below were lilac-trees purple with flowers, and their dizzily sweet fragrance drifted up to the window on the morning wind. Below the garden a green field lush with clover sloped down to the hollow where the brook ran and were scores of white birches grew, springing airily out of and undergrowth suggestive of delightful possibilities in ferns and mosses and woodsy things generally. Beyond it was a a hill, green and feathery with spruce and fir; there was a gap in it where the gray gable end of the little house she had seen from the other side of the Lake of Shining Waters was visible. Off to the left were the big barns and beyond them, away down, over the green, low sloping fields, was a sparkling blue glimpse of sea. Anne’s beauty -loving eyes lingered on it all, taking everything greedily in; she has looked on so many unlovely places in her life, poor child; but this was as lovely as anything she had ever dreamed. She knelt there, lost to everything, but the loveliness around her, until she was startled by the hand on her shoulder. Marilla had come in unheard by the small dreamer. So the stage is set. We are caught up in the drama of Anne’s situation, and we want her to be able to stay at Green Gables because we know how much she has fallen in love with the place. This rapture has drawn thousands upon thousands of tourists to Prince Edward Island ever since the book was published. The powerful description not only puts us in this place, but makes us want to go and see it for ourselves. I doubt there is a writer, living or deceased, who has ever captured the beauty of a place better than L.M. Montgomery. 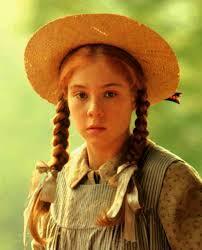 Breaking news: We have just learned that Anne of Green Gables is slated for the silver screen. This entry was posted in Uncategorized and tagged Fiction on June 17, 2014 by Elizabeth Smythe Brinton. 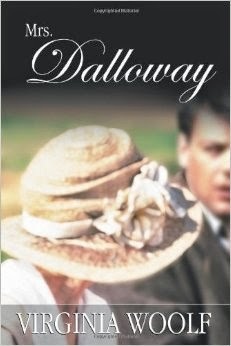 “She stiffened a little on the curb, waiting for Durtnall’s van to pass. 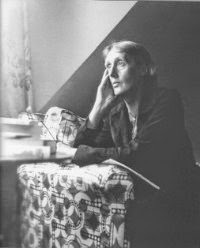 A charming woman, Scrope Purvis thought her (knowing her as one does know people who live next store to one in Westminster) ; a touch of the bird about her, of the jay, blue green, light, vivacious, though she was over fifty, and grown very white since her illness. There she perched, never seeing him, waiting to cross, very upright. This entry was posted in Uncategorized on June 2, 2014 by Elizabeth Smythe Brinton.